Quick and fun ways to learn how to play the guitar. Proper techniques and posture in playing the guitar. Learn basic chords reading and musical sheets. Exercises for tempo and fingerstyle guitar training. Always wanted to start on guitar but find it daunting? Students who are looking to embark on the guitar journey in a flexible and fun way, we have heard you! A course structured for beginner guitar players who wish to start on their guitar journey. Address common mistakes to avoid improper posture when playing the guitar. Customised exercises that will help you perfect the required musical skill for the piece. All students will be able to play some simple songs on the last day of the course*! We ensure that all students learn the proper techniques and avoid common mistakes. The lessons are structured by an experienced tutor to ensure students are learning the guitar progressively. We keep our group class size small allowing greater personal attention for you. Each class are ussually 3-6 students. Is more fun to learn with friends. So why not text them and invite them to have fun together? 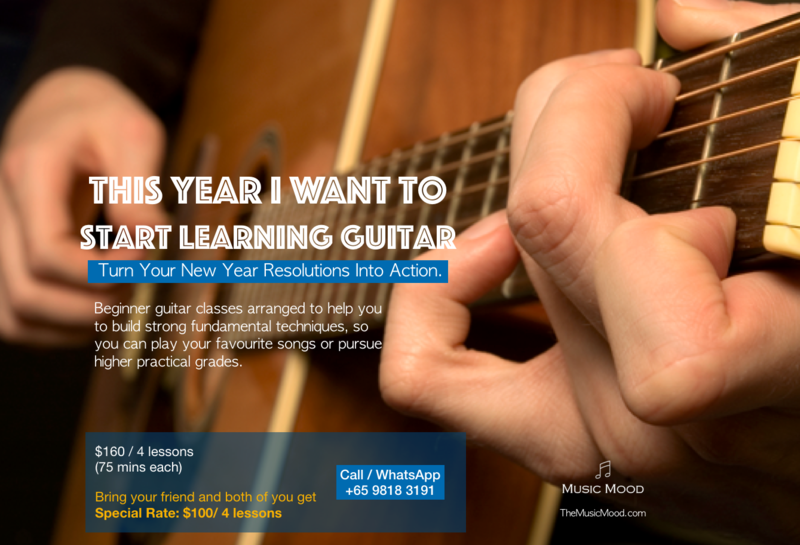 Oh.. Did we mentioned that both of you can enjoy the special rate for first 4 lessons while joining our beginner guitar lessons. I have been teaching classical guitar and acoustic for 5 years. I love playing the guitar and I have been into this entertainment for the past 13 years. My goal is to inspire the guitar learners out there to enjoy playing the guitar and enhance their music studies further into a higher education or in terms of a career. I also have a dream of earning a Ph.D. in Music, focusing on improving tutoring abilities in both instrument and theory. I have been performing with various guitar celebrities such as Sungha Jung, Kotaro Oshio, and Andy McKee. I will show my students how to learn some tricks and guitar techniques to make a great guitar composition and to play like their guitar celebrities. Taking up exams is a serious investment for many potential guitar learners and I will help you to excel in both your practical and theory. Learn how to play your favorite songs today with our experienced GUITAR teacher! Copyright © 2010 – 2017 Music Mood Pte. Ltd.